When most of us are on duty, using the radio and MDT systems may only be an afterthought. As interns, we used those systems the way the released members told us to, the way we saw and heard others using them, and didn’t give it much thought afterwards. We mainly just use these tools to get through our calls and our shifts. Few of us realize that our radio and MDT habits have been evolving for decades. Occasionally a major technological development (like a new Computer Aided Dispatch or “CAD” system) will require us to make big changes (like calling ourselves “Ambulance 1421” even if we are running out of Station 3). More often, however, we just keep doing what we always did. Unfortunately, “what we always did” has its roots in the late 1950’s and early 1960’s, when Motorola first put products on the market that made mobile radio communications practical. 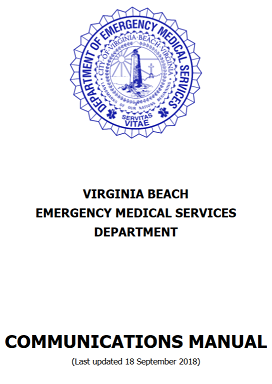 In those days, a year’s worth of ambulance trips in what is now Virginia Beach only numbered in the hundreds — and public expectations were relatively low. We are now running more than 46,000 calls per year in a major metropolitan area whose population has very high expectations for efficient operations. Our communications focus must now change to achieving peak performance for the sake of delivering optimal clinical care. It introduces the Common Operating Picture concept. It introduces the Tight Dispatch Cycle concept. It now includes Sterile Cockpit material. It stresses better use of tac channels. All members, career and volunteer, are encouraged to put the practices and procedures specified in this policy-level document into effect immediately.